$19 - A hip look, this tween tank comes from PPLA. The soft white knit is lightweight and looks great with the new PPLA shorts. 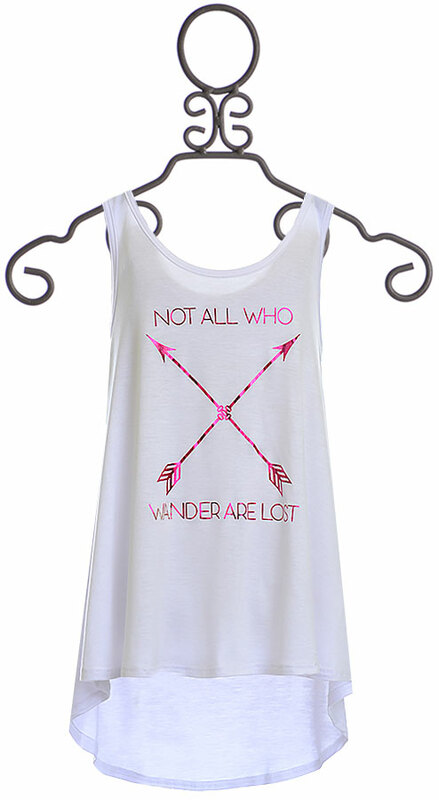 The hem falls in a high low shape and the neck is a wide U. Metallic hot pink creates the "not all who wander are lost" script upon the front with crossed arrows. 95% Rayon and 5% Spandex. Hand Wash Cold, Lay Flat to Dry. Made in the U.S.A. ONE SIZE 14/16 LEFT.